STOUGHTON, Mass. – Sharon didn’t have the majority of possession or chances on the road at Stoughton on Tuesday afternoon. But the Eagles did walk away with the most important thing: two points. Those two points clinched a share of the Davenport division title, and by the end of the night, because of Foxboro’s win over Canton, Sharon clinched the title outright. The 2-0 win over Stoughton gave Sharon its first ever boys soccer Davenport title and first league title since 1994. Stoughton set out to use the wind to its advantage in the first half but Sharon registered the first two chances on goal. In the 6th minute, Ben Stamm sprayed Jake Teven wide along the right sideline. Teven put in a service over the Stoughton keeper the died in the area but Andrew Reyes-Jones’ close bid hit off the far post. Just two minutes later, the Eagles once again were able to escape the pressure from the Black Knights. Stamm found himself on the right sideline wish possession and again, floated a ball that fell to the back post where Reyes-Jones redeemed himself with the close tap in to make it 1-0. It looked like Stoughton would pull one back immediately as Loubensky Lucas used a nice move to get into the area along the touchline and had his cross knocked down on a handball. However, Sharon sophomore keeper Ethan Kantor used a diving save – his feet stopping the shot down the middle to keep the Eagles up. For the rest of the first half, Stoughton was on the front end of things but couldn’t convert a dozen crosses into the area. Conor Kavanaghhad one cross hit off the crossbar and cleared and then another fall right through the area without a recipient latching on to it. Rami Hourabidelivered a tempting free kick right into the area but again, Stoughton couldn’t pounce on the loose ball in the area. The pressure continued into the second half, despite the Black Knights playing against the wind. Noah Schulze connected with Lucas, who had a neat touch to put Jordan Asnes into the area but his bid rolled just wide at the far post in the 45th minute. In the 58th minute, Goddy Fombe found Kavanagh in the area but his tight angle shot found the side netting on the outside at the near post. One minute later, Kantor had his biggest save in the run of play, robbing the Knights of the tying goal. Asnes stayed patient as he gained possession in the attacking third, allowing runs to develop and finding a streaking Fabio Ponce De Leon up the middle. Ponce De Leon unleashed a shot that look destined for the back of the net but Kantor made a leaping save, punching the ball clear. Stoughton continued the pressure as Ponce De Leon connected with Kavanagh for a cross to Lucas, for a touch to Asnes, only for the shot to be partially blocked and smothered by Kantor. “I don’t know what it is but the final decision, I don’t know what it is,” Stoughton head coach Aaron Salter said. “Not sure if it’s that we just need that one point to get into the tournament or what. We just have had so many games this year where we’ve dominated we just can’t seem to get…I don’t want to say luck, we just can’t seem to get it done. Sharon had a pair of chances on the counter in the 63rd and 65th minutes but both shots were turned away by Stoughton keeper Matt Gallagher. The Eagles iced the game in the 72nd minute, using the counter to play the ball over the top of Stoughton’s high line. Spencer Hall sprang Marques Benton in alone and he made the most of his chance with a shot into the back left corner. Sharon boys soccer improves to 9-3-4 overall, and 8-3-3 in the Davenport. The Eagles will conclude the season with a home and home series with Milford, first visiting the Scarlet Hawks on Thursday. Stoughton falls to 8-8-1 overall. The Black Knights will need to get at least a point when they host Canton on Thursday in order to qualify for the state tournament. NORTH EASTON, Mass. – If there is any pressure on Oliver Ames this season after winning the program’s first state title a year ago, they didn’t let it get to them in their season opener against Stoughton. The Tigers exploded for six goals in the second half and junior Matt Alvarado notched his first career hat trick as Oliver Ames rolled to a decisive 7-1 win over the Black Knights. Both teams took turns with spells of possession in the opening 20 minutes but neither could find space for a serious scoring chance. OA goalie Jack Carroll was forced into the first save of the game in the 18th minute, pushing aside a lofted shot from Noah Schulze aimed for the far post. Carroll came up big again, denying a touch at the near post from sophomore Fabio Ponce De Leon after a pass from Jordan Asnes. OA nearly opened the scoring off of Carroll’s punt as Thomas McCormick flicked it on, finding a streaking Matt Campbell but his bid went off the far post and stayed out. Ten minutes later, the Tigers would finally break through. Campbell carried down the left side line, and over ran his touch, but was able to get back and keep possession. He centered to Alvarado, who let the ball take one bounce before hitting it on the half volley from 20 yards out, with the ball bouncing in at the near post. It didn’t take very long for Oliver Ames’ offense to finish in the second half, finding the back of the net twice inside the first five minutes. First, McCormick played Alvarado in along the right edge of the 18 and he launched a shot to the far post and in to make it 2-0. A minute later, Alvarado centered a pass for McCormick, who was taken down in the area for a penalty. Stoughton goalie Matt Gallagher saved the penalty bid but Alvarado came charging in from outside the area and buried the rebound for the hat trick to make it 3-0. The Black Knights finally found their rhythm minutes after the Tigers took a 3-0 lead. Schulze’s free kick dropped in behind the defense and Jordan Asnes ran onto it but his touch went off the post and stayed out. Two minutes later, Tyler Melo fed Asnes, who found Ponce De Leon at the near post, but his bid was just wide. The Tigers really put the game away in a span of less than 30 seconds. Junior Cam Vella took possession just over midfield and took a touch wide with a runner streaking down the sideline. The defense collapsed, opening a lane up the middle the Vella found Campbell. Campbell went in alone on goal and tucked it in. 19 seconds later, junior Jack Sheldon sent a ball in over the top for junior Mason Galbato, who got under it to loft a shot into the back of the net to make it 5-0. Stoughton pulled one back in the 70th minute. Sophomore Johnny Neves uses a header on the left sideline to find junior Nick Comeau in the middle. Comeau took a touch and ripped a low shot that found its way in at the near post to make it 5-1. OA junior Tyler Jones added another for the Tigers on a shot from 30 yards out that found the upper corner and junior James Gillespie headed in the final tally in the waning minutes off assists from Jones and Joe Cerqueira. “If you [OA] them a chance, they’re going to punish you and it was very much that today,” Stoughton head coach Aaron Salter said. “I said the the boys at the end, just winning that first ball – six of the goals came from not winning that first ball. At this level, against anyone, that ball is going to come over the top and if you win that first one, the danger is gone, you reset and start again. I sort of felt like we didn’t play our game today and get going enough. 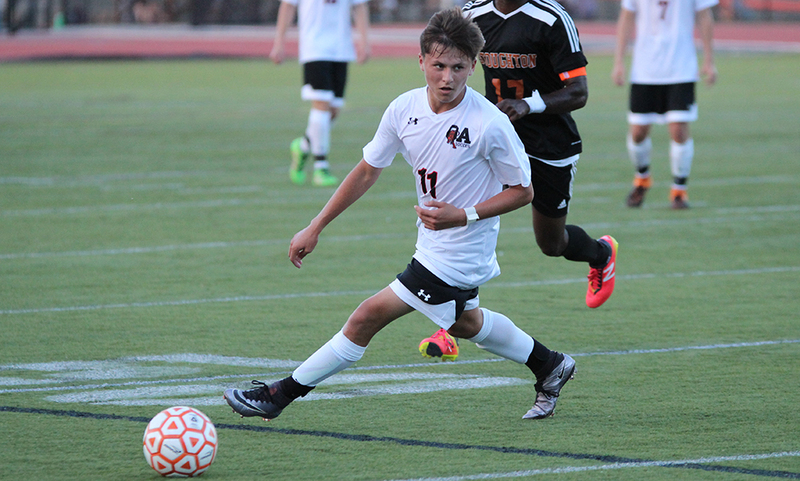 Oliver Ames boys soccer (1-0-0) will be back in action on Monday with a trip to former division rival Sharon (0-0-1). Stoughton (0-1-0) will look to bounce back when they open their home schedule with a visit from Attleboro. For the first time in a decade, the Bulldogs missed out on the postseason last year but with a large group of experienced players returning, the 2016 team is looking to start a new playoff streak. Canton graduated just two starters from last year’s team and looks to be in the mix for the Davenport division title this season. Canton will look to its four captains for guidance with the quartet spread out nicely on the field. Junior Jake Verille and senior Ben Waterhouse will bring skills and versatility to the midfield. Senior Danny Hartnett is experienced and will anchor the back line while classmate Sammy Papakonstantino will be relied upon to be a catalyst up top for the Bulldogs. Erickson added there is a battle for the starting goalie spot right now between senior Sean Mitchell and junior Abe Garber. It will be far from easy for Foxboro to replace the 2015 HockomockSports.com Player of the Year Devante Teixeira (20 goals, 16 assists), who graduated, and two-time league all star Joe Morrison (eight goals, 15 assists), now playing full-time with his academy team. But senior Anthony Barreira (18 goals, 12 assists) is back for his fourth year on varsity and the Warriors get former league all star Jeff Melo back to bolster the back line, which will make the transition easier. Barreira is set to be a top striker in the league and Melo showed during his sophomore year that he can be one of the best defenders in the area. AJ Bubencik’s conversion from a defender to a midfielder will be key for the Warriors this season as well. Sophomore Nic Beigel had a great rookie campaign and will be a key piece for Foxboro this season along with juniors Shawn McNamara and Ryan Kelley. Aaron Wentling and Bobby Harrison will fight for the starting spot in net this season. “We are not the same team as last year but the quality is still here and my expectations are to win games,” head coach Joe Franchino said. Milford had a strong debut when it joined the Hockomock League in 2013 but were able to capture just seven league wins over the past two years. Brian Edwards has taken over at the helm of the Scarlet Hawks and is looking for a bounce back season in his first year. The Scarlet Hawks will be relying upon its three captains to make the turnaround. Senior Marcello Panno is one of the most versatile players in the league with Edwards referring to him as a ‘swiss army knife.’ Edwards expects Panno to play roles both offensively and defensively. Defensively, senior Danny Mendoza is going to be tasked with handling top strikers from around the league. Edwards credited Mendoza’s work rate and his ability to make those around him better. Junior Andre Oliveira will be a major part of Milford’s attack this season. Oliveira will be one to watch, especially on the counter attack. Edwards also noted the team will focus on a team defensive effort, with an effort to deny opponents space in the final third. After a rough couple of years, the North Attleboro Rocketeers are hoping a switch to the Davenport Division could be the perfect platform to launch a turnaround. With a good amount of players that saw either starting minutes or valuable time off of the bench back, the Rocketeers will look to ramp up their play, especially on the offensive side of the ball. Juniors Noah Barney and Zach Matracia saw a lot of minutes as outside backs last year and will look to bring that experience back this year. Senior John Brennan will try to anchor the back line from the center of the pitch while the Rocketeers look to find the right fit in the middle to complete the defense. Junior Brendan Matracia will occupy the goalkeeper spot with a good amount of minutes played from his sophomore year under his belt. Offensively, senior captains Leo Charlebois and Conor Danahey will be two of the main options up top. Burgess noted that junior Josh Rodriguez had a strong summer and will be a playmaker this year. In the middle of the pitch, junior Gabe Pinhancos will be complemented by classmate Ryan Pasquel and sophomore Marcus Costa. Even though Sharon lost a strong group to graduation, the Eagles are relying on a new crop of seniors to lead them in 2016. The Eagles also expect to get contributions from juniors, sophomores and freshmen in different areas of the field. Senior captains Ian Camilli and Shali Patel will lead from the heart of the field at center midfield while fellow captain Benjamin Stamm will be a viable attacking option. Sophomore Ethan Kantor will take over the starting job for Andrew Filipkowski, a 2015 HockomockSports.com Best XI selection that graduated. Shubojit Roy-Chowdhury will be the anchor of the back line as a center defender. Head coach Bryan Kelly is looking for breakout seasons from Oliver Hu, Jacob Tevin, Jeremy Cabral, Marques Benton Jr., Spencer Hall, Andrew Reyes-Jones and Michael Baur. “[On top of our seniors and juniors] there will be several sophomores and freshman called up throughout the season who will only add to the strength of the team,” Kelly said. After another successful campaign, the Black Knights are hoping to push their postseason streak to three straight years. Stoughton will face the challenge of graduating seven seniors, including some key pieces from each part of the field, but there the group of returning players should give the Black Knights plenty of optimism. Stoughton has scored over 30 goals in back to back seasons (38 in 2014, 31 in 2015) and will look to make their offense a strong suit again this year. The Black Knights are returning three of their top four scorers, including sophomore Fabio Ponce De Leon (eight goals, two assists), Jordan Asnes (five goals, five assists) and Loubensky Lucas (five goals, one assist). Lucas has been finding the back of the net for three years and head coach Aaron Salter notes he’s had a strong preseason thus far. Defensively, the Black Knights are hoping experience will help anchor the back line. Tyler Melo will be a factor in the midfield while Goddy Fombe and Noah Schulze both emerged as strong options on defense last season. Salter admitted there were players in new spots last year but now with a year under their belts, they have developed the awareness and look strong in the preseason. 1st Quarter: (NA) Connor Flynn 34 yard field goal. 2nd Quarter: (D) Bobby Maimaron 47 yard pass to Darnell Riley, Matt Antonino XP good. 3rd Quarter: (NA) Nick Morrison 6 yard rush, C. Flynn XP; (D) B. Maimaron 1 yard rush, XP failed; (D) B. Maimaron 29 yard pass to James Cavallo, J. Cavallo 2pt pass to B. Maimaron good. 1st Quarter: (M) Mike Fallon 18-yard run, 2-point failed. 2nd Quarter: (M) Fallon 29-yard run, 2-point failed; (S) Jake Gibb 36-yard pass to Jack Connelly, XP blocked. 3rd Quarter: (S) Ryan Sullivan 8-yard run, Gibb XP; (M) Mack Feeney 2-yard run, 2-point failed. 4th Quarter: (M) Fallon 67-yard pass to Derek Perkins, Koby Osazee 2-point run good; Fallon 68-yard pass to David Perkins, 2-point failed; (S) Izon Swain Price 1-yard run, David Cellucci 2-point run good; (M) Osazee 20-yard run, XP blocked. 1st Quater: (N) C. Mudge 2 yard rush, XP failed; (OA) Charlie Ryan 65 yard pass to Shawn Cardoza, Steven Scurti XP good. 2nd Quarter: (N) Mark Sigwart 12 yard rush, XP failed; (OA) C. Ryan 40 yard pass to Connor Moroney, S. Scurti XP good. 4th Quarter: (N) Brady Bailey 3 yard rush, B. Bailey 2pt rush good; (OA) C. Ryan 10 yard pass to S. Scurti, XP good. #3 Oliver Ames, 1 vs. #19 Milton, 0 – Final – Thomas McCormick scored in the 33rd minute off an assist Keegan Nutt for the lone goal of the game. Oliver Ames advances to the D2 South Quarterfinals and will host #6 Hingham on Sunday, 11/8 at 5:00. 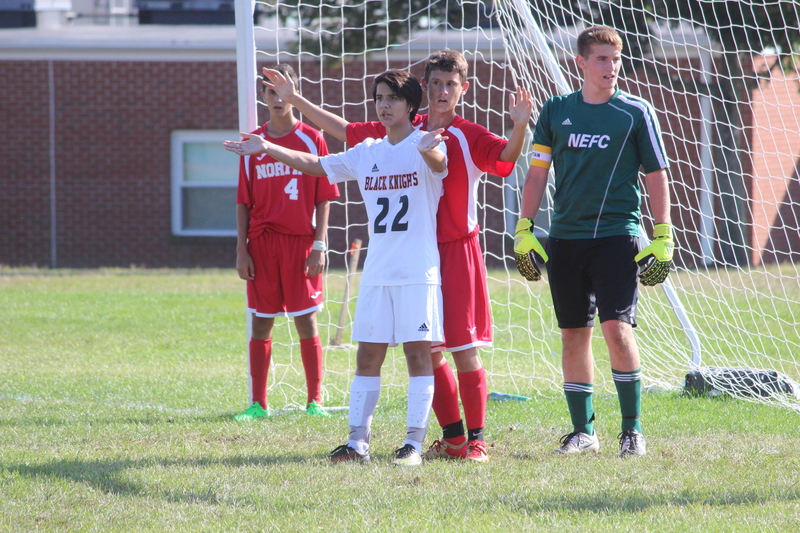 #15 Stoughton, 2 @ #2 Greater New Bedford, 4 – Final – Josh Mitchell put the Black Knights ahead with an early goal off an assist from Loubensky Lucas but GNBVT rallied to take a 2-1 lead at halftime. Will Peoples drilled a shot off the crossbar and in off a pass from Noah Schulze to level the game but GNBVT regained the lead 3-2. The Black Knights pushed numbers forward and went to three in the back and the Bears found the back of the net one final time. #3 Foxboro, 5 vs. #19 Dedham, 1 – Final – Foxboro advances to the D3 South Quarterfinals and will host #6 Rockland on Sunday, 11/8 at 3:00. #3 Franklin, 3 vs. #14 Walpole, 0 – Final – Victoria Stowell broke the deadlock nine minutes before halftime with an “olimpico” straight from a corner kick. Alexis Stowell and Meghan Doherty scored in the final 10 minutes to wrap up the win. Franklin advances to the D1 South Quarterfinals and will host #11 North Attleboro on Sunday, 11/8 at 4:00. #12 Mansfield, 4 @ #5 Bridgewater-Raynham – Final – Jen Kemp scored a pair of goals while Jackie Carchedi had a pair of assists and also scored one goal. Katie Bongarzone also chipped in with a goal as the Hornets got the win at the road. Mansfield advances to the D1 South Quarterfinals and will travel to #4 Needham on Sunday, 11/8 at 2:00. The Mansfield boys will play Needham before at 12:00. #1 Mansfield, 4 vs. #16 Duxbury, 2 – Final – Caroline Maher netted all four of the Hornets’ goals in the win over Duxbury. Mansfield advances to the D1 South Quarterfinals and will host #8 Wellesley on Sunday, 11/8 at 2:00. #4 Franklin, 4 vs. #20 King Philip, 0 – Final – Kelsey McPhee opened the scoring off an assist from Annie Walsh in the 11th minute. In the 23rd minute, Cassi Ronan added a goal off an assist from Taylor Reutlinger. Diana Griffin scored an unassisted goal and assisted on a goal by Walsh in the second half. Abby Campbell made 12 saves for KP. Franklin advances to the D1 South Quarterfinals and will host #5 Dennis Yarmouth on Sunday, 11/8 at 1:00. #11 Oliver Ames, 2 @ #6 Somerset Berkley, 1 – Final (OT) – Nicole Walker set up senior Missy Krim for a breakaway chance in overtime and the senior co-captain buried it to give the Tigers the win. Walker scored the go-ahead goal in the first half off an assist from Hannah Friend before Somerset Berkley leveled it in the second half. Head coach Janice Sundell said Katie Davenport, Christina Boudreau and Sarah Stevens all played well defensively. Oliver Ames advances to the D1 South Quarterfinals and will travel to #3 Sandwich on Sunday, 11/8 at 3:00. #23 Canton, 2 @ #7 Norwood, 1 – Final – Caroline Hagan scored once in each half as the Bulldogs scored the upset on the road at Norwood. Canton advances to the D1 South Quarterfinals and will travel to #2 Walpole on Sunday, 11/8 at 2:00. STOUGHTON, Mass. 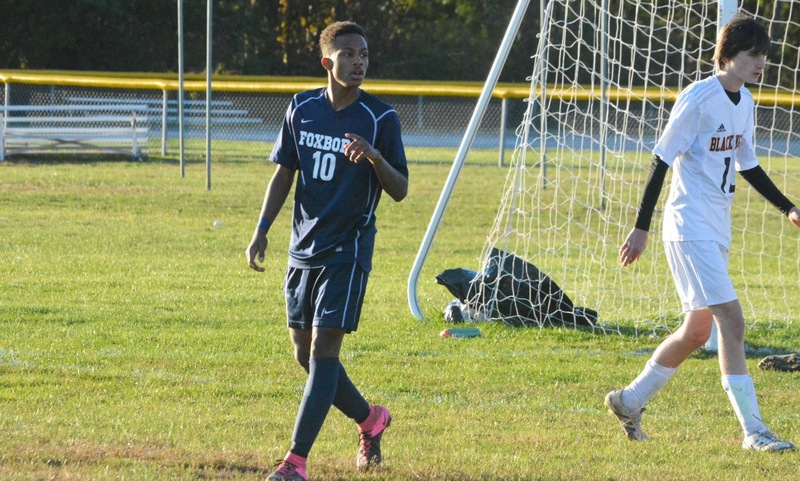 – The pitch was not in great shape, it was cold out, the wind was blowing, and facing an opponent that it had beaten by five goals in the first meeting, Foxboro came out sluggish to start the game against Stoughton on Friday afternoon. Down by a goal at halftime, first-year coach Joe Franchino stood outside the team huddle and senior captain Robby Lowey led the team talk, imploring the Warriors to step it up in the second half. The talk worked. Foxboro got into gear in the final 40 minutes and its three attackers, Devante Teixeira, Anthony Barreira, and Joe Morrison, each scored goals to give the Warriors a come from behind 3-1 win that keeps them in the Davenport title race with two league games remaining. Stoughton took the lead just six minutes into the game. Noah Schulze, who had only minutes earlier flashed a header narrowly wide, stayed with a loose ball that bounced off of Foxboro keeper Clay Leopold and finished. The best Foxboro chance of the first half fell to Morrison, but the sophomore midfielder was unlucky to see his shot ricochet off the post after a decisive through ball by freshman Nic Biegel. Barreira also had two shots saved by Stoughton keeper Kyle Silverman at the half hour mark but overall it was a subdued first half from the Warriors. Teixeira in particular was limited in his touches and impact on the game with left back Jeremy Fishman keeping him under wraps with help from centerback Goddy Frombe. “I thought first half we did a great job in terms of our shape, our organization, how we wanted to play, how we approached it,” said Salter. After the break, things changed drastically Teixeira, who had seemed frustrated in the opening 40 minutes, suddenly looked like the player that is leading the league in points. He terrorized he left side of the Stoughton defense and eight minutes after the break he equalized. Morrison tried to get room on the edge of the box but the ball bounced into the path of Teixeira and he managed to flick it past two defenders and hit it first time into the bottom corner. Just a minute later, Teixeira was through again but was denied by Silverman. In the 52nd minute, he go to the byline and cut it back for Hussein Kafel but the sophomore’s shot struck the post and stayed out. Teixeira also had what appeared to be a second goal, but the officials waved it off because the shot had actually gone through the netting outside the post. In the 69th minute, he forced a mistake and rounded the keeper only to have his chance cleared off the post by Frombe. Stoughton had a couple of chances in the second half. A long goal kick by Silverman picked out Josh Mitchell up front and his flicked header found Fabio Ponce De Leon but his close-range chance went wide. In the 64th minute, Mitchell sent a header wide from a corner. The missed opportunities would hurt because Foxboro would take the lead in the 70th minute. Barreira collected the ball near midfield and dribbled at the heart of the Stoughton defense. The Black Knights hesitated and allowed Barreira to line up a shot that slipped inside the post from the edge of the box. With only five minutes remaining, Morrison wrapped up the two points for Foxboro. He kept possession in the box despite being surrounded, created a foot of space, and smashed his shot into the roof of the net giving Silverman no chance. The win moves Foxboro to within a point of league leading Oliver Ames, which plays on Saturday, with two games remaining. The Warriors will face Sharon on Tuesday. Stoughton needs three points from its remaining two games to qualify for the postseason. The Black Knights will face Canton on Tuesday night.